Communal British Standard Locks, be safe, be sure with us. North London Locksmiths Ltd. can supply and fit your Communal British Standard Locks to your front door, allowing both security and ease of exit, in case of fire. If you want to buy and fit them yourself, why not purchase them from our Keys-Locks-Padlocks WEB Shop, at a discounted price? Telephone our office for advice, you will speak to a member of our Locksmith Team. If you live in the North London, North West London or Enfield areas, why not use North London Locksmiths Ltd. to supply and fit your British Standard Locks? We are the Number "ONE" Locksmiths for these areas and offer a NO QUIBBLE GUARANTEE on new any locks fitted by our qualified Locksmiths or Carpenters. 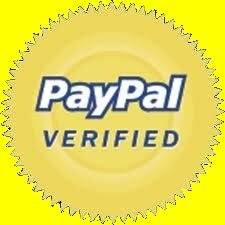 Or for any advise you need on Locks or Locksmith work. The Friendly Locksmith Team of North London Locksmiths Ltd. are always willing to help you. We are a family run business having been trading from the same address for more than 35 years. 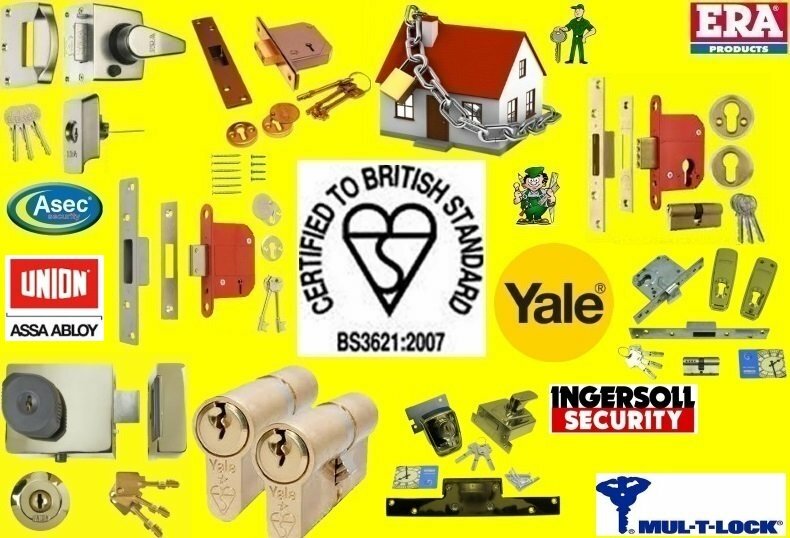 Our Carpenters and Locksmiths recommend the British Standard Locks that you fit to your Communal doors, giving very good security and enabling all tenants to vacate the premises, without having to fumble for keys in the event of a fire, would be the ERA British Standard Egress Rim Lock and the ERA British Standard Fortress Euro Profile thumb turn lock. If you have a letter box, in the door, also fit a letter cowl. Both these British Standard Locks can be fitted on their own or together, they can be keyed alike, (one key will open both locks), or be fitted with restricted keys, only cut on production of signed card. We offer a fast and reliable fitting service of all types of locks whether Communal British Standard Lock or British Standard Locks for offices, back doors and domestic houses. Communal British Standard Locks just a small selection of what we offer. The ERA British Standard Rim Egress Lock is a high security dead latching night latch, which automatically dead latches, preventing slipping of the lock, when door is closed. It cannot be double locked or locked from the inside, thus enabling an easy exit, in case of fire, also, preventing a tenant from being locked in between their flat door and front door, if leaving their key inside flat, but, can be opened with a key from the outside. This night latch gives high security and is insurance approved. FITTED WITH THE ERA BRITISH STANDARD FORTRESS EURO TURN KNOB DEADLOCK, MAKE YOUR COMMUNAL BRITISH STANDARD LOCKS ON YOUR FRONT DOOR VERY SECURE. The ERA British Standard Euro Turn Knob Deadlock, paired with the ERA British Standard Rim Night Latch, gives a high security Communal door. 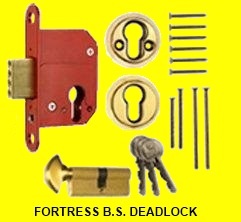 This ERA Deadlock can be locked from the inside, by turning the turn knob, but can still be opened from the outside with a key. 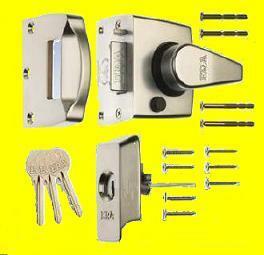 Both these ERA locks come in BRASS, SATIN CHROME or CHROME finishes. They are both recommended by police and Insurance Companies. REMEMBER IF FITTED TOGETHER THESE COMMUNAL BRITISH STANDARD LOCKS OR THE DOMESTIC BRITISH STANDARD LOCKS CAN BE KEYED ALIKE, IN ORDER THAT ONE KEY WILL OPEN BOTH LOCKS. For the fitting of your Communal British Standard Locks, use the Number "ONE" Locksmiths.......North London Locksmiths Ltd. If you live outside the North London, North West London or Enfield areas, or would like to fit them yourself, why not purchase them, singly or as a pair, through our KEYS-LOCKS-PADLOCKS WEB SHOP. If you would like an estimate for supplying and fitting these Communal British Standard Deadlocks or any other type of locks, please fill in the estimate form below, or telephone 0208 800 6041 to speak to a member of our Locksmith team.